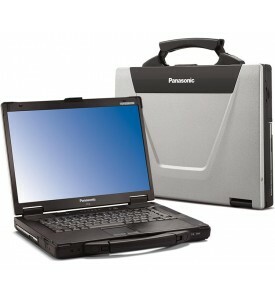 At a Glance	The rugged Panasonic ToughBook CF-52 laptop. The CF-52 is a high specification, i5..
At a Glance	The rugged Panasonic ToughBook CF-52 laptop. The CF-52 is a Dual Core, rugged toug..
Computers and especially mobile devices such as laptops have become such an integral part of our daily lives, both in the personal and business world that it would be hard to imagine having to manage without them. Today's technology has allowed the laptop and tablet to become an essential business tool with improved wireless connectivity, extended battery life, enhanced computing power and desktop rivalling speed, graphics & performance. These improvements however are all to often jeopardised by the fragility of the laptop. The vast majority of computer manufacturers focus all of their efforts on trying to sell the customer on specific attributes of their laptops, such as how much memory it has and the make,model and speed of the CPU etc. All of this technology however is next to useless if the laptop stops working or breaks when it is used in any environment outside of the traditional desk in an office. Panasonic realise that modern businesses demand that a laptop needs to work all types of environments and conditions which is why that came up with their Toughbook range of laptops. Laptops still offer much more computing power than tablet and so there are occasions when a laptop will be needed no matter what the location or environment is.The range offers highly capable laptops for almost any environment, from the added peace of mind and protection in the office to a building site. From the freezing cold and rain to the scorching heat and dust. Features such as advanced LCD technology which provide an anti-glare help the Toughbook's visibility when used outside. Model specific heat pipe configuration improves the heat dissipation from crucial internal components. This is a very important feature because Toughbook's don't have to rely on fans for their cooling, with fans being one of the most common components to fail and cause problems in laptops. They can perform whilst in the harshest environments as well as withstand fluid spills, dust and dirt and being knocked, banged and dropped. Panasonic Toughbooks allow people to fully concentrate on doing their own job without having to always worry about keeping their laptop safe and protecting it from traditional laptop damage. 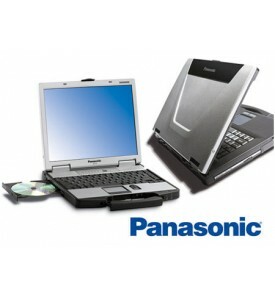 The Panasonic Toughbook range can cater of any particular business need and are offered in 3 distinct categories. In a typical business environment which consists mainly of being in an office or in a clean work area with tables and chairs, components that are mostly damaged are the hard disk, keyboard and display and this is usually due to the laptop being dropped or placed in a bag and carried with too many heavy impacts. A Toughbook can withstand a drop of over 70cm even when the hard drive is spinning. Accidental spillages are also a problem in the business environment, especially with the increase in coffee and hot drinks being consumed at work these days, but a unique drainage system on the Toughbook means that even a liquid spill of 200ml will not damage the keyboard, so the laptop remains functional and the electronics inside the casing remain dry and unharmed. These Toughbooks go even further and our designed to be used on the move and in an exterior environment. The display and other intricate components are protected by a casing that is reinforced with magnesium and crucially the hard drive is mounted with special polymers which insulate it from shock and vibration. The Toughbook is fully portable and can be carried about in a casing that is scratch and impact resistant. This fully protected Toughbook comes in a number of different configurations which include the traditional laptop as well as a laptop with a swivel screen which can help when it is used in rugged or uneven terrain. The casing is made from magnesium which protects the most sensitive parts of a laptop. Hard drives are more firmly secured against impact, so much so that a Toughbook can be dropped from almost 1 metre in height and still continue to function. Additionally the Toughbook outer casing is water and dust resistant. They can effectively operate in temperatures as extreme as +60 degrees Celsius to -20 degrees Celsius, so there is nowhere that they cannot be taken and used. The different levels of protection offered within the Panasonic Toughbook range vary depending on the cost of the model, obviously the more protection and rugged the laptop is the more expensive it becomes. Another option that combines the best of both worlds is to buy a refurbished Toughbook. This is a second hand laptop that is taken and fully reconditioned meaning that the laptop's hardware is completely upgraded and the laptop has it's operating system fully re-installed. Choosing a reconditioned Toughbook is a cheap alternative to buying a brand new Panasonic Toughbook and what you end up owning is a robust and rugged laptop able to meet all day to day and almost any business demand. Used laptops are taken apart and then put back together using top quality materials and so the result is just like a brand new rugged laptop but for a much cheaper price. In fact a refurbished Toughbook is the sensible choice for most people who predominantly use a laptop for either business or pleasure or both. Very few people regularly back up their computers and so if a laptop is damaged or broken quite often all of the users personal data, pictures, videos and everything else stored on the hard drive is lost forever.By purchasing a reconditioned Panasonic Toughbook, accidental spillages,drops and impacts which unfortunately do happen on a regular basis would not result in the user losing all of their personal data and media and would even save them having to buy a new laptop. 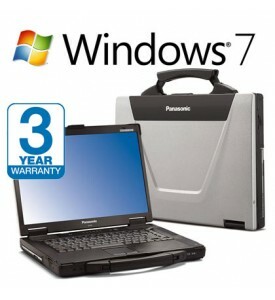 A reconditioned second hand Panasonic Toughbook is the ideal choice for people who could benefit from the added protection of a Toughbook on a day to day basis, people who spend a lot of time on their laptops and who take their computer with them most of the time to the business users who need a laptop to work in all types of environments and conditions.